I would love to claim to be a superfood guru who would wilfully substitute red wine for broccoli juice and live off sprouted mung beans for sustenance. That is not a realistic projection. That does not mean for a moment that there are not certain foods often labelled ‘super’ which I do not thoroughly enjoy eating, but not necessarily in isolation. Whilst I am very far behind on the latest trends (there is a long list to be fair- I still actually prefer paper books to their electronic counterpart), Kale is something I started to explore a few months ago. Depending on where I do my grocery shopping, it is not the easiest of ingredients to find with regularity (and growing my own is out of the question). There is also a growing season (in the UK at least) from June until the end of March, so hopefully you can add this to your list of new things to try before this season ends. So, what is this Kale then? Not surprisingly, there is an excellent website dedicated to Kale which I would encourage you to read at your leisure. In short, it is brassica (so part of the cabbage family), and is very versatile and nutritious. Hopefully this alone will encourage you to try and make one of my super quick vegetarian dishes (for Vegans, please omit the Parmesan cheese and you’ll be good to go), and be a good alternative to a week night supper or lazy brunch at the weekend. Chickpeas are a staple store cupboard ingredient for me (normally reserved for making Chickpea hummus), and again, I am sure is pretty good for you. In less than 15 minutes from scratch, (and with the added bonus of minimal washing up to do) you will have something which even a protein loving Neanderthal such as myself would gladly eat, and feel well nourished too. 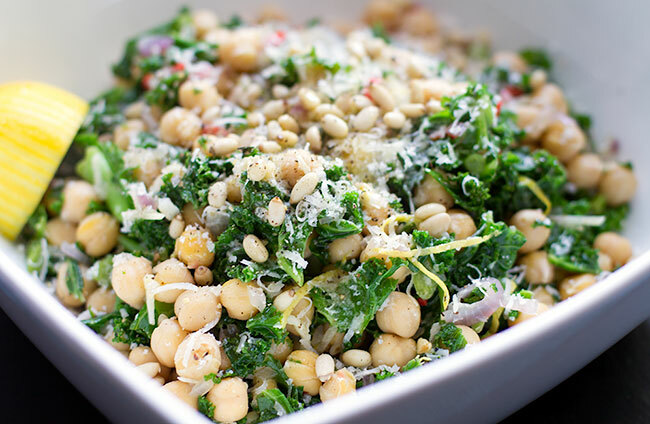 Finally, I really struggled with a name for this concoction – whilst certainly not a traditional salad by my own definition, I hope that this warm chickpea, curly Kale and pine nut salad gives you as much pleasure making it as it did me. As ever, please let me know what you think of this recipe and feel free to comment/share with friends. Heat a large pan to a medium heat, and add the olive oil. To this, add the red onion, red chilli and lemon zest and sweat for 2-3 minutes until soft. Then, add the garlic and cook for another minute or so. Next, add the curly kale, stir through, and cover the saucepan with a lid. Check every minute or so, and stir through thoroughly until the kale has started to wilt. Season with salt and pepper, add the lemon juice, then add the drained chickpeas. Stir through, cover, and warmed through for a further 3-4 mins. Once warmed through, turn out into a salad bowl and sprinkle over the pine nuts, a generous grind of black pepper, and add the grated Parmesan cheese. Drizzle a little extra olive oil, a squeeze of lemon juice and serve. I would say that not all Chickpeas are created equal. You pay for what you get. If, like me, you prefer opting for tinned rather than cooking from scratch, I recommend the Napolina brand. I find them to be softer and more succulent tan the supermarket own-brand alternatives. Kale is so delicious – glad to hear you have been starting to explore it! Found your site off FBP and love seeing another UK food blogger!